Natalie Rotstein (Undergraduate) – Presented a poster on electrophysiology measurement and sense-making in introductory physics for life sciences laboratories. 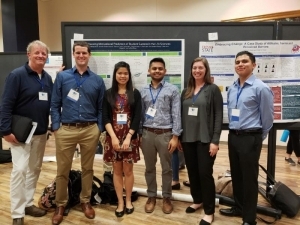 Dhiraj Nallapothula, Selina Han, and Carlos Herrera (Undergraduates) – Presented a poster on enhancing motivational predictors of retention in the life sciences. Photo: (Left to right) Marc Levis-Fitzgerald, Jeffrey Maloy, Selina Han, Dhiraj Nallapothula, Jen Berden-Lozano, and Carlos Herrera stand in front of a poster with results of their mindset intervention being employed in introductory life sciences classes at UCLA.